David S. Goyer (Man of Steel) and Michael Cassutt bring their well-received space opera to a conclusion with Heaven’s Fall. In the two decades since Earth’s first contact in Heaven’s War, the humans aboard the long-range spaceship believed humans and their alien allies, the Architects, successfully prevented the vicious Reivers. Unfortunately, maybe not so much – can the returned humans rescue the rest of our planet, not to mention the galaxy? Michael Cassutt earned his speculative fiction writing chops early on in the fastpaced world of Hollywood, working on television series such as “Strange Luck,” “The Outer Limits,” “Eerie Indiana,” and the iconic 1980’s show “Max Headroom.” In Heaven’s War, Michael once again teams up with “Batman Begins” and “The Dark Knight” screenwriter David S. Goyer for the second book in the Heaven’s Shadow series. Bookplates signed by David will be available with the purchase of Heaven’s War from Mysterious Galaxy. David S. Goyer is currently considered a "single author." If one or more works are by a distinct, homonymous authors, go ahead and split the author. 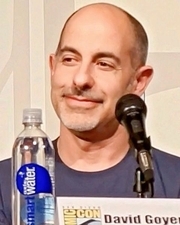 David S. Goyer is composed of 5 names. You can examine and separate out names.